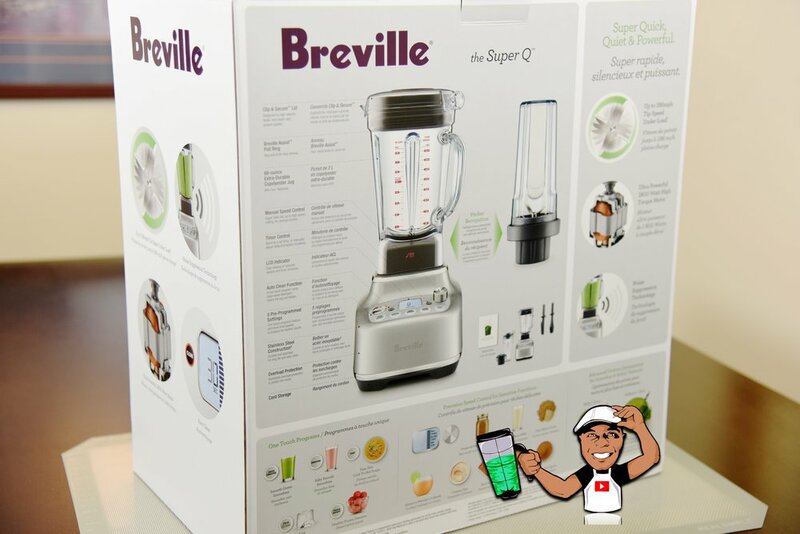 ORDER THE ALL NEW BREVILLE SUPER Q BLENDER WITH FAST FREE SHIPPING HERE! Breville has been hitting some home runs lately. They were kind enough to send me a review copy of their all new Super Q blender. It’s very powerful, has noise suppression technology, an improved cooling system and is vacuum compatible with the optional Vac Q pump. The Breville Super Q comes with everything in the box you need to get blending. You get a 68oz blending jug, a 24oz single-serve blending cup, tamper, scraper tool and a recipe book. The Breville Super Q is very well built with a hard bodied high polished stainless steel motor base housing. It features 5 presets for Touch n’ Go blending, a stainless steel variable speed control knob, programmable timer and a cleaning function. I really like the built-in cord wrap. There are still a great many blenders on the market that do not offer this feature. Breville stepped it up by using a retractable cord. Much easier to keep your kitchen nice and tidy without lifting the blender to wrap up the cord. The 68oz blending jug is of very thick construction with easy to read measurement markings. It has new redesigned blades, metal gears and a metal retainer nut. I was very impressed by the construction. The 68oz jug lid contains the Breville trademarked helper handle to make it easier to remove the jug lid. The design of the 68oz jug gives plenty of room to fill it with lots of ingredients. I created my new recipe called the Henry Healthy V12 Smoothie and it blended 100% perfect. This recipe contains root veggies that are tough to break down. No issue here. Grab the recipe for Henry Healthy V12 Smoothie recipe HERE. The Breville Super Q comes with a 24oz single-serve blending cup with a spill-proof lid. While the build quality is good, I was disappointed that it wasn’t double-wall constructed. That helps keep cold beverages cold and hot beverages hot for longer periods of time. The other issue I have with the single-serve feature is the Super Q only allows for up to 30 seconds of blend time. While that’s fine for mixing simple shakes, if you’re blending frozen ingredients or hard fruits and veggies you may need to blend longer. NOTE: The short blend time may require you to restart your blend which may break down the ingredients too much resulting in over-blending, so keep note of this. I created my new recipe using the 24oz single-serve cup. It’s my Peach Cobbler Protein Shake. I use the Blenditup Protein Powder which I’ve been using for years. Excellent product. Grab the recipe for my Peach Cobbler Protein Shake HERE. Vacuum blending is slowly becoming “a thing” but it’s not there yet. Other popular blenders are still not offering this feature. The Breville Vac Q pump is actually very nice however. It’s smaller than other blender vacuum pumps I’ve seen. It gets the job done but like other vacuum pumps It does take about 60 seconds to fully remove the air from 68oz jug. I did have a bit of trouble getting it to work but that was due to the 68oz jug’s lid not sitting fully in place. The lid has a very thick gasket so it takes some effort to make sure it’s flush to the jug or the pump won’t work. The Vac Q pump sells for $99.95 USD and comes with 4 AA batteries. It’s limited to select recipes which is why I appreciate Breville offering it as an option. Make sure you will find plenty of use for it before investing. So what are my thoughts on the new Breville Super Q blender? First, it’s a beautiful machine, bar none. I like how Breville incorporated a single-serve feature, however it definitely has its shortcomings. I also like how Breville includes everything in the box to get the customer blending right away. The tamper, scraper tool and recipe book are not always included with other blenders. I love the built-in cord wrap. Every blender should offer this, in my opinion. The new noise suppression technology does make for quieter blending. While it is much quieter than it’s predecessor the Breville Boss, it’s not as quiet as the Vitamix Ascent A3500 based on my testing. To be frank, unless your blender has a sound enclosure that fully covers the machine, none of these blenders will be quiet enough to keep your family asleep during early morning blending. The Breville Super Q blender offers a great package, great build quality blends very well. I would rate it 4 out of 5 stars.